When you get on a trans pacific flight, you would expect everything to go smooth. But that didn’t work out so well for me. Just a few moments after the take off from Detroit, I look out my window to see something weird. I didn’t know wings were suppose to do that, and I fly somewhat regularly. 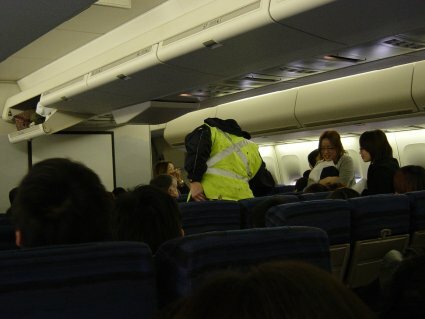 Then to take off my headphones and hear the announcement that there is a “medical” emergency and that the flight will be landing as soon as the fuel has been dumped out and some other things, and I don’t really think much of it, some dude probably had a heart attack. The reason for the fuel dump was that the flight was too heavy to land with that much fuel. So the flight that was suppose to fly longer than half a day is now cut down to 2 hours, great. And so we land. You would think that since its a medical emergency, that there will be medical related people walking about, but no. You see technical people such as the one in the above coming and fixing random seats. I knew northwest airlines were in a bad financial situation, but to use that small time frame to do maintenance, that’s just pathetic unless it was for a different reason. Anyway, after being grounded for 2 hours we leave. Stuff like this seems very much out of place. 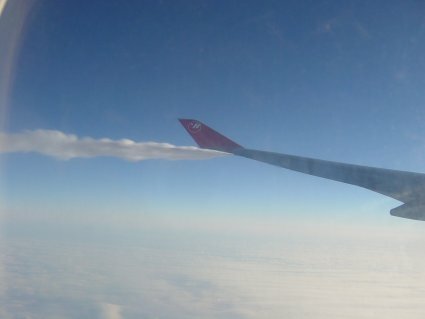 Wonder what people between Detroit and Minnesota think about fuel being dumped above their heads. I doubt its healthy nor pleasant. But then again, its several thousand feet above land. I have been looking around the net and seems like its quite a common practice, but I was not able to look up any numbers on exactly how many flights do that and how often. Usually flights would just circle around burning the fuel if time wasn’t an issue. Simply writing this because there hasn’t been anything said for a while because of my school work and work. Until next time, enjoy.